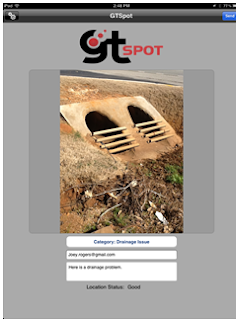 GTSpot facilitates crowdsourced, incident reporting. Users can quickly and easily report a problem, damage, issue, or observation with a Photo, Note, and Geographic Location. Crowdsourcing adds a new dimension to data collection as it empowers both the public and employees by allowing them to contribute valuable information. 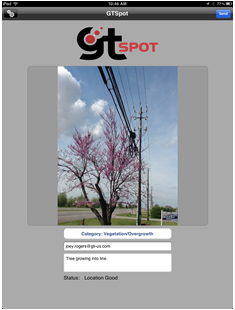 GTI caters primarily to the Utilities Industry and GTSpot was designed for field problems like burned out street lights, day burner street lights, water leaks, vegetation management, line clearance, drainage problems, or anything of relevance that a photo, note, and map coordinate can convey. However, the uses and potential of GTSpot go far beyond our original intent. The GTSpot Client is a very simple application that allows its users to quickly and easily submit a photo, note, and location (latitude/longitude/altitude) to a GTSpot Server. 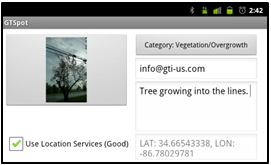 This server can be specified on the app’s Settings page and defaults to GTI’s public GTSpot Server. To use GTSpot, run the app and fill in the information it requests. 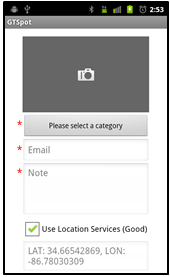 You can click anywhere in the photo area, and it will ask you if you want to “Take a New Photo” (which takes you to the camera) or “Choose Photo from Album” (which lets you pick a photo already on the device). Once a photo is taken or selected, it will display in the photo area. 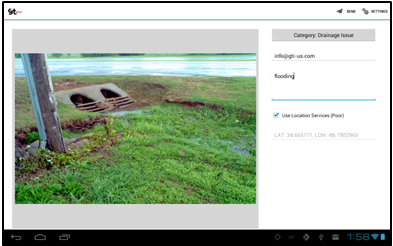 The photo is also optional, so you can post a Note and location without a picture. The rest of the fields are required. Next, press the “Please select a Category” button and select the Category that best describes your post. This Category list comes from the server and can be changed on the server. The Category is used for grouping the posts and routing them to the appropriate person on the backend. The next field is Email. We capture the email address so we can associate the post with a user, and so the server can send a confirmation email if the post is successful. 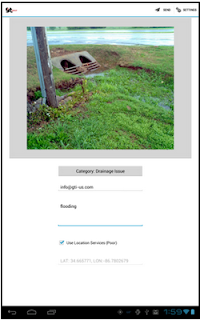 The Email field will be remembered from one post to the next, while the rest of the fields and the photo will be cleared after a successful post. The last field to enter is the Note which is used to describe the incident the user is reporting. The Note is limited to 1024 characters. 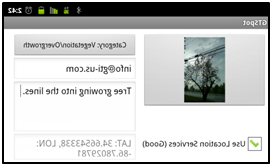 When all of the required fields are entered, press the Send button (at the upper right of the page on Apple devices, and on the Menu button for Android devices). The following information is sent to the GTSpot Server: Photo (if provided), Date/Time, Category Name, Email, Note, Compass Heading, Latitude, Longitude, and Altitude. The user’s IP address is also collected on the server. 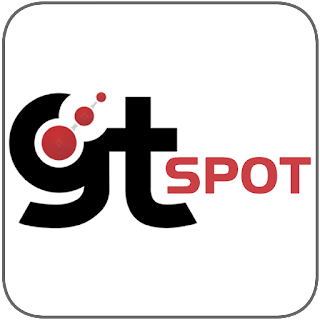 The GTSpot Client app is currently available on the Apple App Store and on Google Play (formerly the Android Market), just search for GTSpot. GTI offers GTSpot branding to incorporate your own company’s logo and badging and fix it to your company’s GTSpot Server. 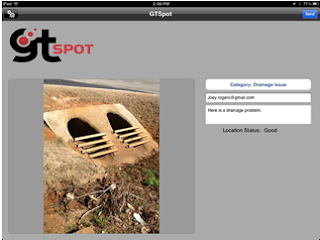 You can then put your branded version of GTSpot on the Apple App Store and Google Play. The GTSpot Server collects all information posted by the GTSpot Client apps. Each posted is stored as a record in its database, email confirmations are send to the GTSpot user for successful posts, and notification emails are optionally sent to an email list defined on the server (the record’s Category field can be used to route these notification emails as well). The GTSpot Viewer application provides a console view of all posts that have been collected. 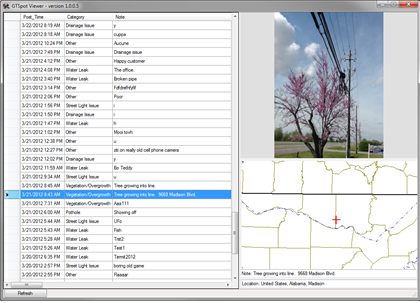 Selecting a record will show the associated image pictures and its geographic location can be shown on any GTViewer dataset. 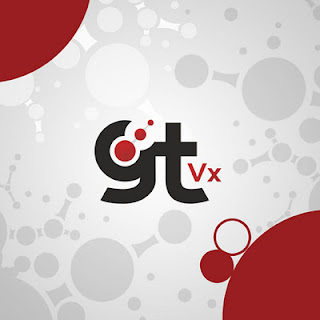 Version 11.0.0.7 of GTVx is available. - NEW - #6959 - The IgnoreDisclaimer Property has been added. - FIX - #6969 - If you set ShowRasterStatus to 1 in the Additional Properties section of the .GTM file, the raster filename will be displayed in the status bar when it is being initialized. - FIX - #6971 - LoadDefaultStyle Info would clear all styles if you were in a Session File created from a .GTX file. - CHG - #6973 - Count button on the Attribute info will now show for all Tabs and not just the Element tab. - NEW - #6975 - UpdateCategoryFiles method has been added. - FIX - #6976 - Problem with ExportView with a .BMP not working after changing data with OpenFile. 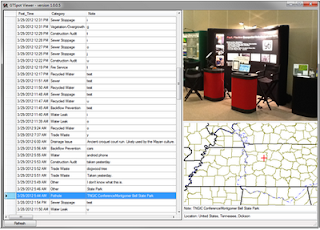 GTViewer version 11.0.0.11 is available. - FIX - #6968 - If Dynamic Graphics were used and an extract was made that excluded a category used by the Dynamic Graphics, the extract would have problems reviewing features. - FIX - #6970 - If a Session File (.gts) is created from a .gtx file, the Tools/Reset to Default Styles would reset to having no styles. - CHG - #6972 - Count button on the Attribute info will now show for all Tabs and not just the Element tab. - NEW - #6974 - UpdateCategoryFiles method has been added. - NEW - #6977 - If a file called nosplash.ini is placed in the product directory, the spash screen will be hidden. - NEW - #6978 - New Methods: IsExternalAppRunning, IsExternalAppRunningEx, StartExternalApp. - CHG - #6981 - Increased maximum number of map items from 1500 to 2500.